Adobe have just released an updated version of the Adobe Lens Profile Creation tool (discussed elsewhere on this website) and a new Lens Profile Downloader application. 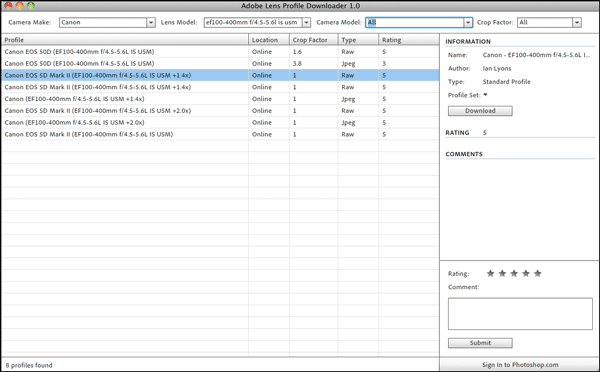 The lens profile downloader is a standalone Adobe AIR application. It’s a free companion application to Photoshop CS5, Photoshop Lightroom 3, and the Camera Raw 6 plug-in, and is intended to allow customers to search, download, rate and comment on the online lens correction profiles that are created and shared by the user community. Lightroom 3 users in particular will find this application very useful, especially if they don’t have a copy Photoshop CS5. As can be seen from the screen shot shown below the UI is relatively straightforward. To find a lens profile it’s a simple matter of first selecting the camera vendor name (e.g. Canon). A list of all available* lens profiles will appear. This list of available lens profiles can be further refined by choosing the lens model from the relevant drop-down menu. Further refinement can be achieved from within the Camera Model and Crop Factor drop-down menus. The downloader application also provides users with the facility to rate and comment on any lens profiles that they have downloaded. However, to comment or rate a lens profile you must be logged on to Photoshop.com. Typically, this will be by inserting your Adobe Account user name and password into the Sign In dialog. * Only community created lens profiles are available via the downloader application. Profiles created by Adobe or their partners (e.g. Sigma, Tamron, etc) are incorporated into the download package for Lightroom and Camera Raw. This entry was posted in Adobe, Adobe Camera Raw, Adobe Photoshop, Adobe Photoshop Lightroom, lens corrections, lens profiles, Photoshop. Bookmark the permalink.